Jazzy two-tone cufflinks, circa 1930. In 1920, David Belais of Belais Bros., a jewelry manufacturer based in New York, received a patent for a gold alloy that was a frosty white. He hoped that the new white metal would be a remedy to the high cost and scarcity of platinum caused in part by shortages during the first World War. Although Belais did not invent white gold (Tiffany & Company had used white gold in a limited way as early as the 1880s), the firm's successful introduction and promotion of the new precious metal led to a blizzard of frosty jewels during the 1920s and 1930s. Among the best of these were jazzy Art Deco cufflinks wedding white and yellow gold. Elegant pinstripe cufflinks, circa 1930. The white and yellow gold cufflinks ran the gamut of Art Deco design from the intricate, busy "complications" of the early 1920s to the simpler, geometric designs of the late 1920s and 1930s. 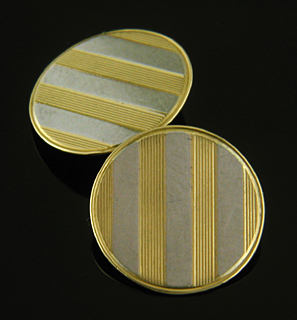 This elegant pair of pinstripe cufflinks illustrates the stark, linear designs of the later Art Deco period. 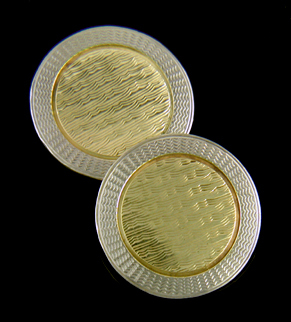 The white gold bands are polished to a mirror-like finish which contrasts nicely with the warmer tones of the yellow gold pinstripes and borders. Created my Richardson Manufacturing Company in 14kt gold around 1930. Ziething two-tone complications, circa 1925. Earlier in the Art Deco era busier designs, sometimes referred to as "complications," were in favor. Frequent readers are aware of the attraction these intricately, almost obsessively embellished cuff jewels hold for me. The level of detail and number of design elements Jazz Age cufflink makers were able to harmoniously place in the small space afforded by the top of a cufflink is astounding. This lively two-tone pair created by Ziething & Company is a wonderful example. Krementz white and gold cufflinks, circa 1930. Art Deco jewels often featured stark, vibrant colors arrayed in patterns of striking contrast. The white and gold cufflinks somewhat softened this trend. They offered engaging contrasts, but in a subtler way. The emphasis was not on bold, arresting colors, but on the play between the cool brilliance of the white gold and radiant, warm tones of the yellow. 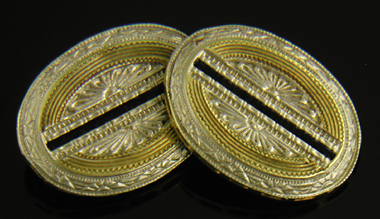 The above pair of cufflinks by Krementz & Company nicely illustrates the manner in which light dances across the varied textures of the white and yellow gold surfaces. Strobell & Crane Art Moderne cufflinks, circa 1930. In the latter part of the Art Deco period starkly dramatic designs reflected the prevailing fascination with speed, industrial design and the forward march of technology. A precursor to mid-century Modernism, the style was referred to as Art Moderne. This dramatic pair of cufflinks created by Strobell & Crane features yellow gold centers crossed by stark bands of white gold, all surrounded by white gold borders engraved in classic Art Deco fashion with a zig-zagging geometric pattern. An elegant expression of the Machine Age chic of the 1930s. 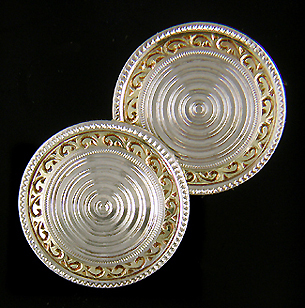 Frank Krementz two-tone cufflinks, circa 1925. Finally, one last pair of Art Deco complications. In this pair mirrored rising sun motifs are surrounded by radiating bands of yellow gold and bisected by a strip of black enamel. A border of repeated sunrise or floral motifs in white gold completes the striking design. Frank Krementz and Ziething & Company were among the makers creating these intricate, richly detailed cuff jewels. For more about the makers of these intricate masterpieces, please visit my earlier post Art Deco - Cufflink Complications. Recent additions to the Antique Jewelry Galleries include a beautiful pair of blue enamel and garland cufflinks by Larter & Sons, bold Art Deco pinstripe links, elegant George O. Street tiger eye cufflinks, and a pair of English cipher cufflinks. Other recent additions include an Egyptian Revival stickpin by Alling & Company and a wonderful "Serpent de Mer" stickpin by French jewelers Plisson et Hartz. Garlands and Blues Classically inspired wreathes of festive garlands surrounding centers reminiscent of exploding fireworks. The elegant design is beautifully set off by rich blue enamel borders. Crafted in 14kt gold by Larter & Sons, circa 1925. Art Deco Pinstripes Elegant Art Deco cufflinks with golden pinstripes alternating with brightly polished bands of white gold. A nice example of the geometric pinstripe designs of the later Art Deco period. Crafted in 14kt gold, circa 1930. Tiger Eye Elegant cufflinks with beautiful tiger eyes set in finely crafted yellow gold. The domed tiger eyes feature rich brown edges shading to glowing, honey yellow "eyes." Crafted in 14kt gold, circa 1940. English Ciphers The Victorians loved richly detailed ciphers of entwined letters and contrasting fonts. These British cufflinks feature a flowing, organic "L" interlaced with a Gothic, wooden "E". Crafted in 9kt gold, circa 1928. Alling Egyptian Revival The flowing, geometric design of this stickpin is a wonderful example of the inspiration jewelers in the the early 1900s found in the arts and architecture of ancient Egypt. 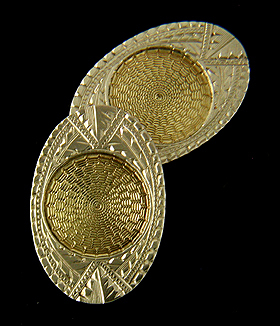 Created by Alling & Company in 14kt gold, circa 1900. Serpent de Mer A writhing sea serpent clutches a luminous pearl. In the late 1800s French jewelers created a menagerie of fantastic and mythological creatures. This boldly sculpted sea serpent with life-like fins and a tail that appears to be floating in water is a wonderful example. Crafted in 18kt gold, circa 1900.